\r\nLaura’s first novella, ‘The Fish and the Freak’, has been released as part of the Young Adult dystopian anthology ‘Moremaids’, published by Pankhearst. Few debut books come with the hype surrounding An Ember in the Ashes. After all, this is the book that caused YA bestseller author Marie Lu to miss her connecting flight because she was too engrossed in it. So when I picked it up, I had pretty mighty expectations. Is the build-up justified? Over 400 pages later, one thing I can say for sure: this is a page-turner. There comes a moment when it's impossible to put it down. Sabaa Tahir is a strong writer, but most of all, she's a great storyteller. Because the story is so gripping, I can forgive the weaknesses that surface in the first part of the book. An Ember in the Ashes is set in a fantasy world in which a Martial elite rules through fear and brutality. It tells the story of Laia, a slave girl who will risk everything to save her captive brother; and of Elias, a young man raised to become a Martial, and whose only desire is to be free from the destiny of violence awaiting him. The interlacing narratives explore themes such as oppression, suffering, the meaning of freedom and its cost. From the beginning, Tahir establishes a rich and vivid world, by drawing on a host of diverse inspirations. The overall setting has echoes of ancient Rome and the Martials vs. Scholars rivalry is reminiscent of Sparta vs. Athens. But what sets this fantasy world apart is the introduction of middle-eastern influences: the scent of spices, the date and apricot trees, the mirror embroideries in the women's skirts, the glass lanterns, the lattice screens. There is also some clever use of coinage - for example, the Martials' swords are called 'scims', which evoked in my mind the curved blades of scimitars. I don't know if this was the effect intended by Tahir, but for me it added to the overall exotic feel. In a genre where the aesthetic is often shaped by medieval Europe and countryside Britain, the result is a strikingly original and visually memorable fantasy landscape. Additionally, there are some inspired ideas here, such as the fact that Martials wear masks that fuse with their faces, at once erasing their original identity and forging a new one devoted to the Empire. Because the world-building is so fully realised, it doesn't bother me too much that, in the beginning at least, it is delivered in a rather expository fashion. There are quite a few internal monologues explaining how the Empire works and how brutal it is, and I feel that the level of violence is over-played at times. This is especially true when it comes to the main antagonist, the Commander: she's painted with very broad strokes, and such heavy-handed use of violence makes her feel slightly cartoonish. Towards the end of the book, we are given some tantalising hints to her back-story, but these elements are not fully explored (not yet, at least) and we don't get to understand her motives or how she became so quintessentially evil. When the portrayal of suffering is more understated, I feel it is also more powerful. This is exemplified by the character of Helene, Elias' best friend, and by her descent into despair, which I found more chilling than the violence and brutality. To me, the plot is the strongest element of this book. Even when the story is squarely anchored in traditional YA dystopian tropes, many of the twists and turns are difficult to predict. The story is complex, encompassing political scheming, betrayal, and supernatural forces, and the different threads entwine effectively. Finally, I should mention that Ember is pitched as a standalone work, but I'm not so sure. This strikes me as the first book in a series - the ending is climatic enough, and yet there are many unanswered questions and plot elements that remain unresolved. Given the level of buzz this story is having and the fact that it will be released in 24 countries with movie rights already sold, a second book is very likely to be released. Not that this is a bad thing; I, for one, will be happy to revisit this world. 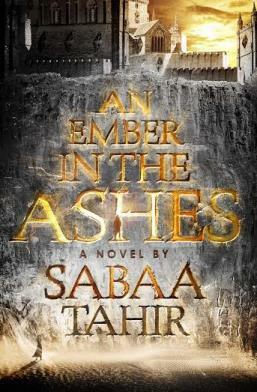 An Ember in the Ashes will be released on the 28th of April in the US and on the 4th of June in the UK. Copies can be pre-ordered by clicking here for the US and here for the UK. Disclosure: I received an ARC (Advanced Reader Copy) of this book from the publisher in exchange for an honest review. This does not affect my opinion of the book.